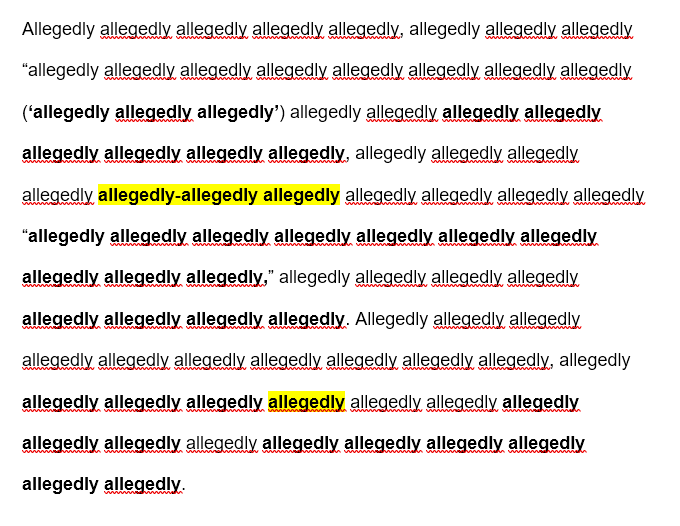 Adoring fans of Stanford’s very own Fountain Hopper were shocked to find that last week’s issue was nothing more or less than the word “allegedly” printed a total of seven hundred and sixty-three times, down to the title of the publication and somehow also its page numbers. The particular style of significant yet apparently random bolding, highlighting, and capitalizing of words was impossible to mistake and was replete with proper punctuation and sentence length, as though the author had simply written a normal article instead of the utter gibberish that was produced. While the FoHo’s reputation as a tabloid-style vigilante fighter is controversial, especially among Daily writers who are jealous of the FoHo’s broad readership, it has until now maintained a baseline measure of coherence and at least a fourth-grade level of legibility. That appears to be changing as either its writers or editors, or both, show signs of suffering from some sort of linguistic collapse, violent stroke, or malicious hex. Some readers’ responses, however, have been less dire than one might have predicted. Several frosh reportedly “did not notice any difference in the content or clarity” of what is being termed the “Alleged Issue.” An even larger number of readers confirmed feeling a strong sense of unease and anger directed towards Stanford’s administration—and in a few cases, Stanford College Republicans—after reading the issue due to some vague injustice that the FoHo was proud to expose.